Please click here to see our full calendar, including community awareness events and trainings. Details: Create a gingerbread masterpiece while building family memories at Community Action’s Gingerbread Extravaganza held the first Saturday in December. 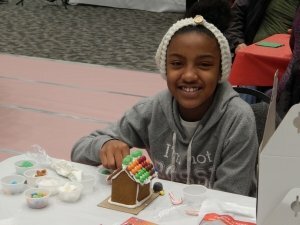 Guests decorate gingerbread houses and cookies, meet with Santa and participate in other fun holiday activities to support Community Action’s local programs. View the latest updates and photos from last year on our Facebook event page. To become a sponsor, contact Beth Tallon, Public Relations Manager, at btallon@community-action.org or (608) 313-1319. To sponsor, attend or volunteer at these events, contact Beth Tallon, Public Relations Manager at (608) 313-1319 or email us.